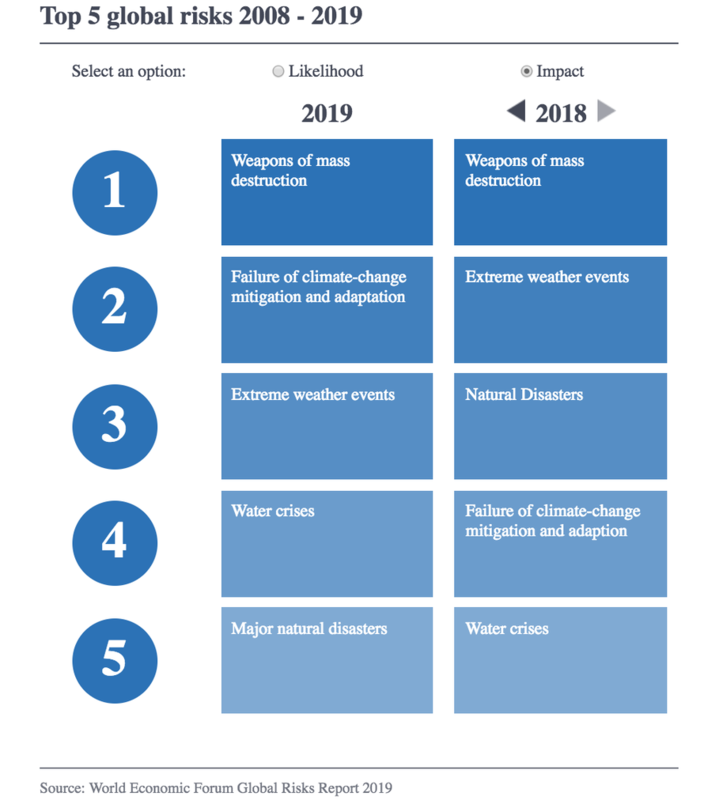 After a chaotic 2018 that saw expectations for global economic growth deteriorate and an explosion of volatility across financial asset classes, the World Economic Forum's Global Risk Report, an annual assessment of the biggest risks facing the global economy published on Wednesday, was even more downbeat than usual. And in continuation of several of the biggest themes from last year's report, the WEF (whose members were apparently blindsided by the sudden emergence of economic populism, which is posing an unprecedented threat to the increasingly interconnected economic order) highlighted the rise of populism as one of the biggest risk factors, which they warned would be exacerbated a slowing economic growth, tightening financial conditions and more market chaos ahead. 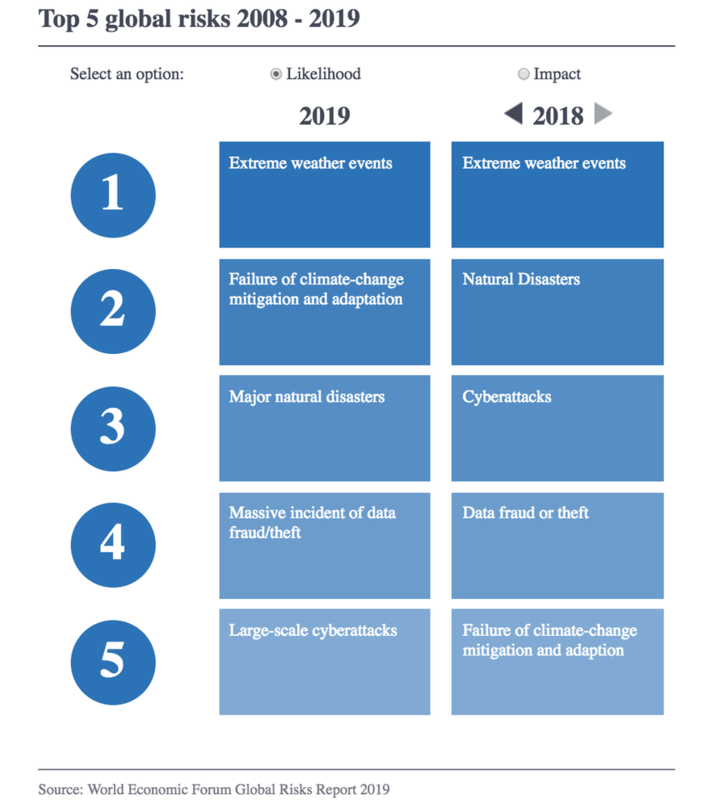 Other major risks highlighted in the report included climate change, rising sea levels, emerging biological threats and emotional and psychological strain. Some 90% of the "experts and decision makers" polled by the WEF said they expected further confrontation between major economic powers, while some 88% said they expect further erosion of trading ties. But if something isn't done about the increasingly "state-centered" politics (ie nationalism), the WEF is worried that the world won't be able to nimbly cooperate and respond to threats. If another global crisis were to hit, would the necessary levels of cooperation and support be forthcoming? Probably, but the tension between the globalization of the world economy and the growing nationalism of world politics is a deepening risk. In searching for something - anything - to blame for the rise of populism (that is, aside from policy decisions dictated by increasingly out-of-touch elites) - the report hits on the growing occurrence of mental illness around the world, though they elide over the drivers of the "societal changes" that the WEF researchers believe are at the root of this problem. Worldwide, mental health problems now affect an estimated 700 million people. Complex transformations— societal, technological and work-related—are having a profound impact on people’s lived experiences. A common theme is psychological stress related to a feeling of lack of control in the face of uncertainty. These issues deserve more attention: declining psychological and emotional wellbeing is a risk in itself—and one that also affects the wider global risks landscape, notably via impacts on social cohesion and politics. So, how do we stymie the populist tide? WEF says that "renewing and improving the architecture of our national and international political and economic systems" is the only way forward...whatever that means. Undoubtedly closing the global infrastructure investment gap is one solution. But the deeper issue of "reconfiguring relationships between countries" sounds much more vague. Looking ahead, we imagine we'll be hearing more about these issues next week as the world's financial and global elite gather in Davos for the world economic forum, where they will complain about the risks that populism poses to the international world order while munching on caviar and attending lavish parties (with any luck, U2 will make an appearance).